Bake 2 cans Pillsbury™ refrigerated French bread as directed on can; cool. Lightly spray 13x9-inch (3-quart) glass baking dish with cooking spray. 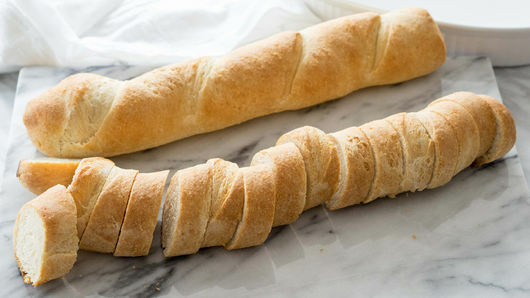 Cut cooled bread into 1/2-inch-thick slices. Place half of the slices in even layer in baking dish. 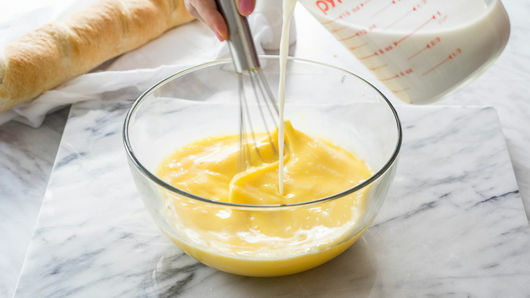 In medium bowl, beat 8 eggs and 2 cups cold milk with whisk until well blended. Beat in 1 can (4.5 oz) Old El Paso™ chopped green chiles. Season with salt and pepper to taste. Sprinkle half of the shredded sharp Cheddar cheese (1 cup) over first layer of bread; refrigerate remaining half of cheese. 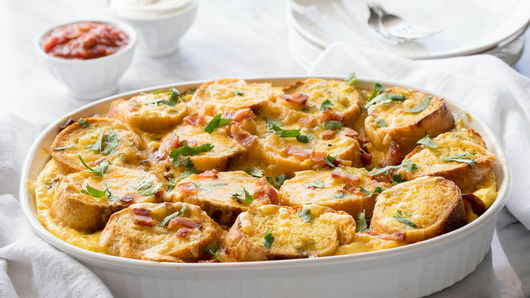 Reserve 2 slices from 1 lb crisply cooked thick-cut bacon; arrange remaining cooked bacon slices over cheese in dish. Ladle half of egg mixture over bacon. Top with remaining half of bread slices in even layer. Ladle remaining egg mixture over top, making sure to soak each slice of bread. 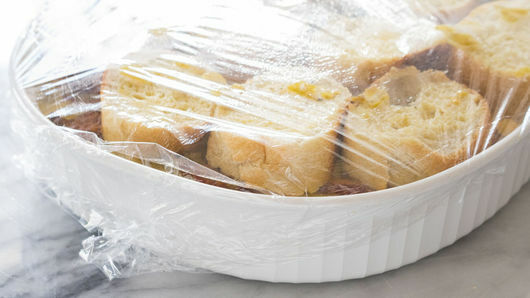 Cover tightly with plastic wrap. Refrigerate at least 8 hours or overnight. 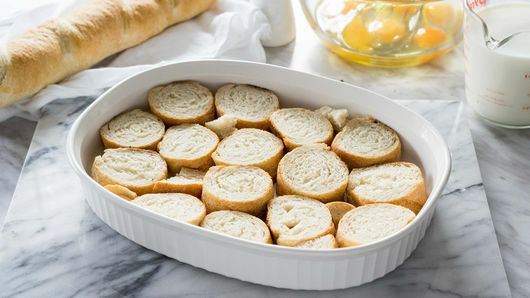 When ready to bake, remove baking dish from refrigerator; let stand on counter while heating oven to 350°F. Bake uncovered 40 minutes. Remove from oven. 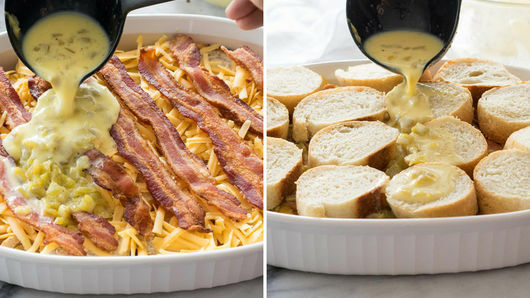 Sprinkle with remaining cheese (1 cup); crumble and sprinkle reserved 2 slices cooked bacon over top. Return to oven; bake 10 minutes longer or until cheese is melted and knife inserted in center comes out clean. Cool 5 minutes before serving. Garnish with chopped fresh cilantro. Switch out the bacon for cooked ground breakfast sausage. 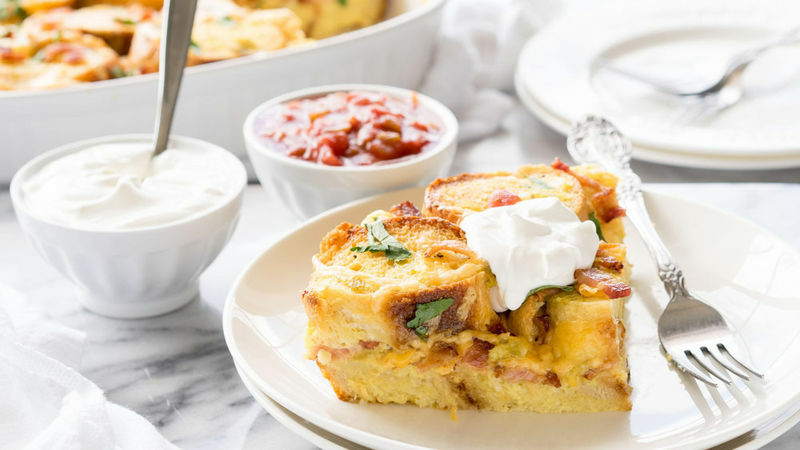 Serve with your favorite breakfast burrito toppings like sour cream, Old El Paso™ Thick ‘n Chunky salsa, breakfast potatoes, hot sauce, etc.